It’s not the ultimate lighting-control system, but it’s a great solution for some thorny problems. Philips’ Hue connected LED light bulbs are among my favorite connected-home devices. But when I’m relaxing at home, I frequently don’t have my smartphone in my pocket—it’s usually in the kitchen plugged into a charger. That’s where the new Philips Hue Wireless Dimming Kit comes in handy. Stick it on the wall and you can turn your Hue lights on and off, or dim and brighten them. The mounting plate can attach to the wall with adhesive strips, or if you’re patient and careful, you can separate the two-piece back, attach the back half to the wall with a couple of screws, and snap it back together again. And for those times when you don’t want to get up from the comfort of your recliner, you can just pull the magnetic remote out of its socket before you sit down. The kit—which is also a great solution for rooms that don’t have a wall switch controlling a lamp plugged into a wall outlet—comes with one Hue white LED bulb and it works right out of the box—there’s literally nothing to configure once you screw in the light bulb and pull that plastic tab out of from the battery in the remote. The supplied bulb is rated to produce warm white light (at a color temperature of 2700K) with 800 lumens of brightness. That’s equivalent to a 60-watt soft-white incandescent bulb, but the Hue consumes just 9.5 watts of electricity. 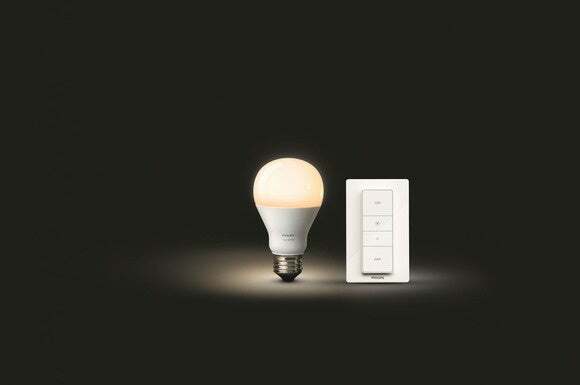 Philips estimates the bulb should last 22.8 years, based on three hours of use per day. You can detach the switch from its wall mount and use it as a handheld remote. The bulbs dim and brighten very smoothly. Turn them off and they’ll retain that brightness value the next time you turn them on. If you want to control more than one light, you can pair up to nine additional bulbs—anything in the Philips Hue series—to the one dimmer. Just hold the dimmer close to the bulb (which is in a socket, of course), hold the On button down for 10 seconds or until the bulb flashes, and then release the button. The only drawback is that all the lights linked to the dimmer will turn on/off or brighten/dim at the same time. 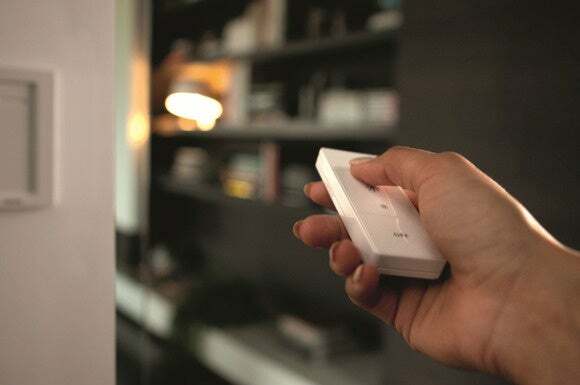 If you want to control lights in multiple rooms, you can buy a controller and a bulb for each room. For more sophisticated control, you can add the Philips Hue bridge to the mix and enroll the bulbs to both controllers. Having the bridge gives you the ability to control lights individually or in groups using a smartphone or tablet app. And since the bridge connects to your router, you can create schedules and control the lights from anywhere you have Internet access. The Philips Hue Wireless Dimming Kit, which consists of the dimmer switch and one white LED bulb, is priced at $40. Additional bulbs cost $20 each, and the dimmer switch can be purchased on its own for $25. This isn't the be-all, end-all lighting-control system, but it's both convenient and it can solve a common problem, especially in older homes.